I do love a good list. The new year slipped quietly in last night while N8tr0n and I were watching a documentary. Wild and crazy I know. I believe it is only one step away from going to bed at 8:00 pm on new year's eve. Can't wait to hear about your own resolutions. I also can't wait to meet a new blogger who can give me some sewing lessons. Then I could cross two things off my list right away. That is a good list, Miranda. May I borrow some of your list items? Great list! And GREAT handwriting. So, um... I DID go to bed at 8:00 (ok, it was more like 8:30). Pretty sad. I noticed that you have an item on that there list indicating that you'd like to learn to sew clothing. You may want to tune into my blog: www.atmymothersknee.blogspot.com (shameless plug alert!). I sew a good portion of my own clothes and I'm putting together tutorials (in printable format) of my process. For now, I'm concentrating on very, very simple and straightforward items. I hope to have the first installment ready in a couple of weeks. Awesome list, by the way! May have to steal some of those and sneak them onto my (already overloaded) list. 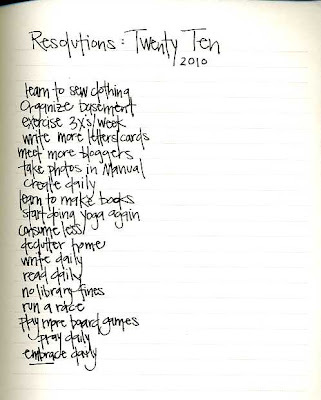 Great list and I too love your handwriting. It would make a fab font! Love the little things on your list that can make the biggest difference to life like "declutter home" and "embrace daily". I am so down with the no library fines resolution. I won't divulge how much I've paid this year, it's embarrassing. But, I'd rather pay the library than the video store. nice list. I too am looking to get back into yoga more. And a recent PIf has pushed me to learn how to make books. Not that hard, a couple of how to's from the library and you will be up and running fast. Happy 2010! Hey! What part of Denver do you live in?